GraceLinBlog: Goodbye, Year of the Dragon! Tomorrow is Chinese New Year, the start of the Year of the Snake and the end of the Year of the Dragon! It's been a lovely year, I can't complain. Sure, there were some disappointments, but they were pretty minor compared to the wonderful gift I've received. So I wanted to say a fond farewell to the Dragon by sharing this little activity. This is actually a bit of a sneak peak to the Children's Book Week Bookmark I am creating, but it's also just a fun, simple way to celebrate the New Year! 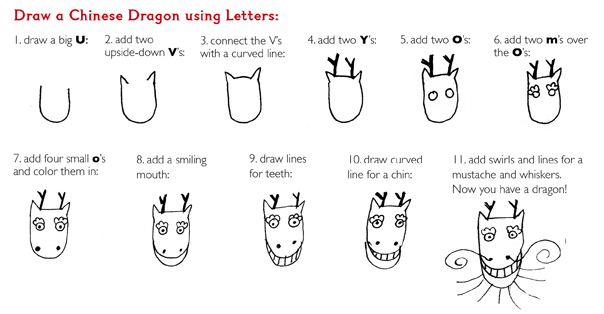 Draw your dragon on a red sheet of paper and hang it for good luck!